The Master List of Saipan bloggers has been updated over on The Saipan Blog. There are currently over 140 Saipan bloggers along with almost 20 Coconuts Abroad. Bloggers are requested to add a link to the Master List as it is the most comprehensive list of Saipan (and Tinian and Rota) blogs. Carnival of the Blue XVI will be hosted on The Saipan Blog next month. If you have a post on your blog about the ocean, whether it be fishing, conservation, or something that is just cool, please email me the link and I will include it in a special CNMI section of this month's carnival. 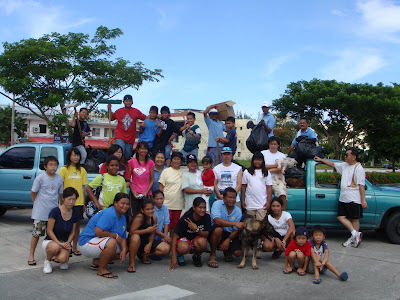 We had a good showing for last week's monthly cleanup of the Garapan Tourist District. Thanks to everyone who pitched in!